One for each of my little pumpkins! Our weekend was filled with lots of family and lots of Fall! On Sunday, we attended the Jansen Family Fall Party, hosted by Greg’s Uncle Jerry and Aunt Barb. We had a wonderful time. In true Jansen style, there was a TON of great food — five types of chili, side dishes, Halloween-themed desserts, and more! A guest of one of Greg’s cousins even commented that she’s never seen anything like it since her extended family is much smaller. I’m certainly accustomed to the big family lifestyle — the Goeddes sure know how to throw a party and pull together some great food too! Thus, I’ve always felt right at home when celebrating holidays with the Jansens. 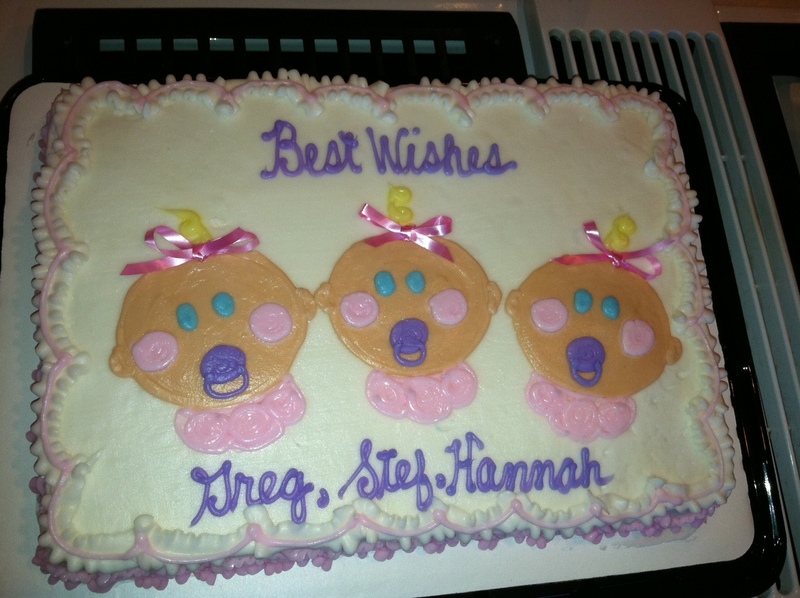 Barb had a special triplet cake made! The party also doubled as a triplet baby shower for us. We loved the fun activities that were planned, including a game called “Keeping Up With the Blog!” As you might guess, the questions were all about tidbits of information found here on my blog. Some of the questions were easy (“How many babies are Greg and Stef having?”), while others were a little trickier and required some extensive thinking back to some of my earlier posts (“How did Stefanie say they’ll keep track of each of the babies when they’re first born?”). Obviously, I couldn’t play, but it was fun to watch everyone else come up with answers. The many gifts we received. We were also stunned by the slew of gifts from everyone! These girls are going to be the best-dressed triplets you’ve ever seen! 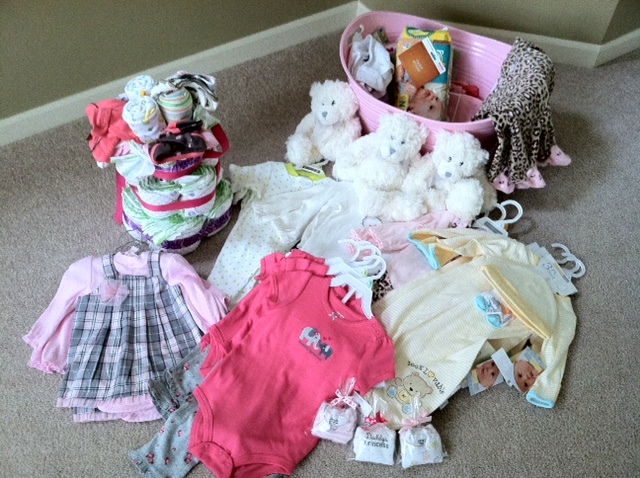 They got their first sets of matching outfits, blankets, teddy bears, a “diaper cake,” gift cards, and more! 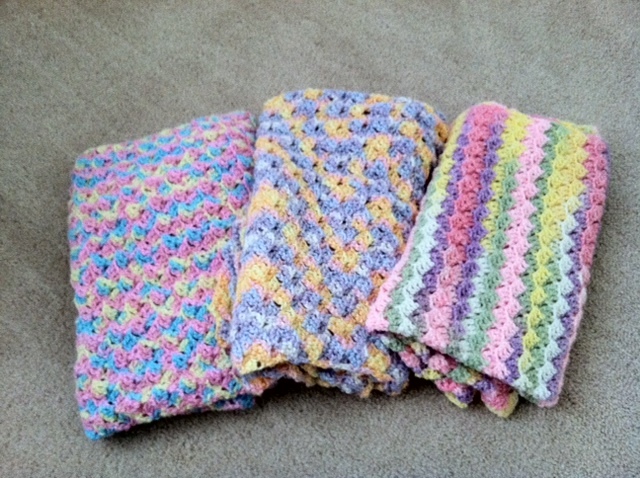 Greg’s Aunt Ann even hand-crocheted three blankets for the girls — each in its own color scheme so they could always have their own. They are so special, and we can’t wait to use them! Hannah wasn’t left out either — one of the matching sets of clothing included a fourth size that will be big enough for her to wear in a few months. Plus, she also got her first baby doll! She loves it and has been playing with it all week. Needless to say, we’re feeling pretty blessed right now from everyone’s tremendous generosity. THANK YOU, THANK YOU!! I have a doctor’s appointment today — no special tests or extensive ultrasounds though. Just a routine visit. The babies and I seem to be perfectly healthy and are moving right along, but I must say, I can really start to feel the pregnancy weighing on me. I’ve had a ton more aches and pains this past week and my stomach seems to get bigger every day. I find relief by practicing a combination of sitting, standing, and laying on my side — any one of those done for too long results in discomfort. I can feel the babies kicking much harder now, and when they move, I can see their movements more defined. I find myself caught in the middle when it comes to the time we have left — I want it to come quickly so I can have my body back and feel better, but I also know that we’re still not ready!! Luckily, we’re moving in less than a week! From there, we’ll be setting up rooms, making our house baby-efficient, collecting baby items that people have generously given or lent us, and packing hospital bags! We’re definitely excited to move and be Southsiders again. Lastly, I’ll leave you with a video of Hannah taking a few steps, as I promised in my last post. We’ve had so much fun watching her learn how to walk! a) I want to play in a pile of corn. b) did Greg say she got bitten at daycare?! ouch!